Human beings have certainly succeeded in populating the planet, and many of us live what we call a civilized life, with comforts and luxuries not only for our bodies but also for our minds. The implacable drive and intense desire to better our lives which got us to this point, however, can become our limitation, whether it manifests in, for example, a lack of ecological integrity, or a lack of patience and wisdom in training horses. It is interesting to consider our relationship with horses in the context of the difference between the extrovert and the introvert personality. The extrovert is the adventurer who is capable of claiming his place and destroying whatever gets in the way. This extrovert outlook will be very successful if the horse trainers goal is to produce a daring performance i.e. attacking a cross country course or winning a gold medal, when nothing can be allowed to stand in the way of progress towards that goal. The introvert status on the other hand is about waiting, contemplating and reacting in a less daring but more intuitive way. It is not about the killer instinct or ambition, but about inner wisdom and peace. Camille wrote this newsletter while I was visiting Thailand, and synchronously I experienced a contrast there which beautifully illustrates the point we want to make here. While visiting one of the innumerable Buddhist temples, I saw an impressive equestrian statue just opposite. Even from a distance, the contrast with the serenity of the ancient temple was striking, but on closer inspection this monument revealed itself as a veritable catalogue of violence and conflict, with numerous panels depicting ferocity and violence in different forms. 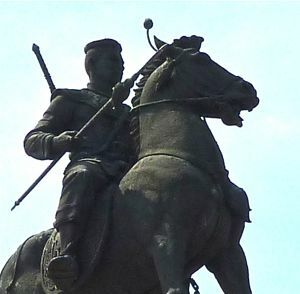 This statue was built in commemoration of the Burmese invasion of Thailand in the 18th Century, by a ferocious army who terrorised the Thai people, as well as destroying and pillaging many Buddhist temples. The relevance of this to our relationship with horses was for me characterized by the depiction of the horse with its mouth pulled wide open by the bit, portraying the rider's dominance through force. The warrior's extrovert nature is made clear by his intent stare into the distance, weapons at the ready to fight and conquer. 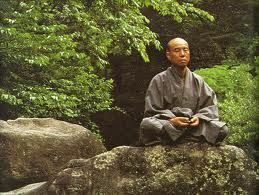 Compare this with the inward-looking serenity of the Buddhist in meditation and the contrast is clear. It doesn't take a lot of reflection to know which attitude is more conducive to happiness and positivity, for both the individual and relations with others. 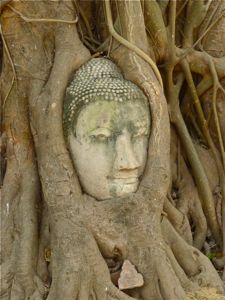 One of the most striking and poetic examples of organic harmony I have seen was at another temple in nearby Ayutthaya. The Burmese army frequently beheaded statues of the Buddha, and on this occasion the head happened to have been left sitting at the by a tree. Over hundreds of years the roots of the tree gradually grew around and enveloped the head, which now sits serenely poised within the tree (and strangely perfectly straight!). It is almost as if nature was demonstrating its gratitude for the respectful and peaceful way of Buddhism by rescuing and elevating the vestige. To understand training horses from the introvert's perspective, we could look at it as the 'organic' way. 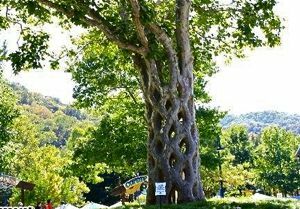 Imagine a tree which begins as a seed in the ground, and helped by symbiotic interactions with fungi to make available minerals and water, the seed germinates and grows. In the same way the horse trainer begins with some time, some equipment which is carefully chosen, a horse, and the relationship starts to grow. The seed has all the information it needs within, in the same way as the trainer has all the inner wisdom necessary to connect with the horse. The only force which can disrupt the natural development of the relationship is the desire to achieve something beyond what each moment presents. To impose rather than to listen, to force rather than allow. 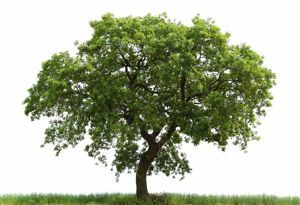 A tree will grow in perfect balance with it's surroundings, taking what share of the nutrient and light it can. When we stay within the balance with our horses, this means we accept the journey as it presents itself, and enjoy the ideas which come to us each day, and what we are learning by our achievements and mistakes. Most importantly it means that we don't follow the advice of our fearful side. This may seem to be contradictory, because surely human desire and ambition has nothing to do with fear? In fact, if we really look deep down inside ourselves, when we need to fulfill a desire, it is always because we are frightened of doing without it. Fear in this context means that we can't contemplate not being able to ride this horse or to hack out, or to do these competitions or show other people what we can do. 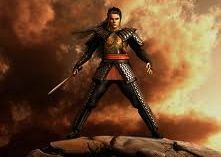 But true creativity can only flourish when we let go of such desires, whether they manifest as the wish to train the horse to this level, jump this height of fence or go to this competition. The motivation we need to work with our horse in a valuable way comes from the relationship itself. Like a tree, there will be winter times when we both need to rest and recuperate. This is far from a waste of time, it is a natural consolidation process, and when we begin again, the new growth we make will be fresh and joyful as a tree in Spring. 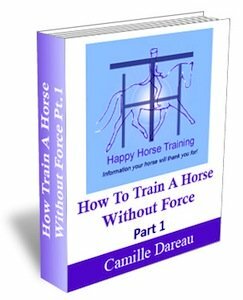 If we train ourselves and our horse in the organic way, there will be many times of frustration, when it seems like we are seeking light which doesn't exist, and we don't seem to have what it takes to survive. If we use these times as opportunities to look within and understand what we need to let go of, then we will continue stronger than before, and one day the fruit will arrive. This metaphor is also directly applicable to the physical relationship between horse and rider. The way of riding (unfortunately all too common in dressage) of forcing the horse into a 'frame' or 'outline' and then obliging him to execute certain movements, is akin to a tree that has been artificially trained into a certain shape: although we have imposed our will in order to create a certain aesthetic result, the beauty of natural organic growth is lost, and the result is what amounts to a freak. 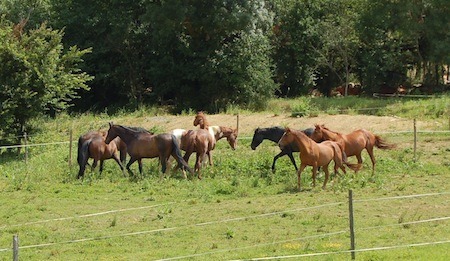 When we use our gymnastic connection with the horse to cultivate the transmission of power through the horse's body by means of engagement, the result has a wonderful purity, and its own path of development and growth that is just like a plant taking root in good soil, and with the right support rather than control, growing to fulfill its own beauty. Organic training can only be genuinely founded on organic management because this is the root of your horses well-being. 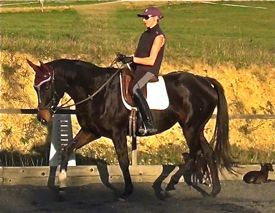 Starting with a horse who is already stressed because of her lifestyle is a big handicap to try to overcome before training has even started. The first way to understand how to see organic solutions is to recognize that there are really no problems with your horse, only opportunities to grow. Imagine you had a frightening experience with your horse, maybe the horse was very difficult and upset one day and started to buck and you fell off. 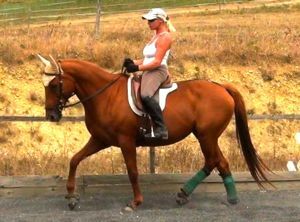 Your fearful side might say "that's it I've had enough of this horse, I'm going to sell him. We just don't click!" or maybe your fearful side tells you that "if you don't 'sort this horse out' he will continue to behave in this way and it is too dangerous to accept" . Maybe your fearful side says " I'm going to let my trainer ride him from now on, he's too much for me" or even " That's it, I've tried riding again and it just isn't for me" or " I'll have to get a stronger bit if he's going to behave like that - or something to stop him bucking" . There are always many possibilities from the fearful voice, and it tends to be the voice which leaps in there first. If you can remember to listen to the voice from your inner self, it might say some very different things, like " My horse would never behave like that without a good reason, I had better find someone to look him over" or " I'm worrying so much about that meeting next week that I am probably giving off negative vibes". Maybe you realize " I forgot that he was cast in the stable last week, maybe he twisted something" or "he has been getting very excitable since he started that new feed" or "that was the first time I really asked him to engage properly, maybe there is something catching in his back". If you listen to your wise, inner voice, you are already on to the next step in your organic journey. The fearful voice doesn't value the journey, only the goal, and if the goal seems unreachable it chooses to give up or change track. Whenever you have questions about your training progress, see if you can distinguish which 'voice', or way of reacting, comes from which source. When you can do that there is no limit to the journey you can make! You can also sign up to our RSS feed (blog) to be kept up to date with new ideas, pages and other information that we post there. Just click on the box that says 'subscribe to this site' at the right of each page.